This brought tears to my eyes when I received it from a friend. 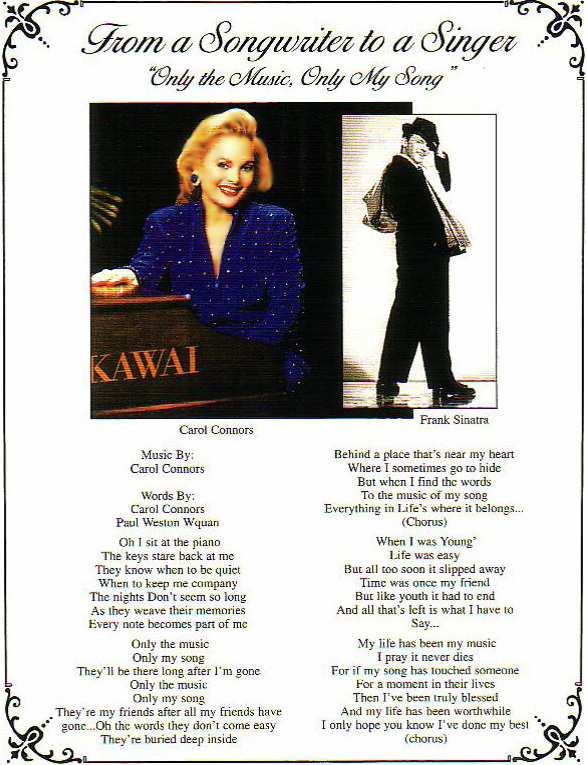 It's an interview with The late Frank Sinatra, done in 1992, and his words about me touch me to my heart. Mr. Sinatra was my hero. He loved and respected the songwriter, and we loved and respected him in return. He not only sang our songs, he felt our music and let the audience feel it, too. CLICK HERE for my song from a songwriter to a singer, "Only the Music, Only My Song". Q: What was one of the first things you learned about singing? Do you still adhere to it? SINATRA: When I first started, it was my idea to make my voice work like a musical instrument. I've always been fascinated with Jascha Heifetz' way with the violin and Tommy Dorsey's way with the horn. Heifetz' constant bowing, when you never hear a break, carries a melody line straight through, just as Dorsey's trombone did. I tried to use my voice in the same way as a violin or trombone--not sounding like them, but playing my voice like them. Q: Outside of music, what are some of your other interests? SINATRA: I've dabbled in oil painting and I like photography. Over the years I've gathered a marvelous collection of model trains, specializing in steam engines. Many of the trains were sent to me by fans and they're very special to me. Barbara and I have several dogs, cats and a parrot named "Rocky." What a greeting they give us when we come home from a road trip! Of course, I like to cook...learned from both my mother and father. Q: What was your most memorable moment with Tommy Dorsey? SINATRA: I was with Tommy for a little under three years and according to my trusty little calculator, that comes to something like 1,500,000 moments--and every one of them was memorable. Q: In your formula for success, what is the main ingredient? SINATRA: What formula? I never had one, so I couldn't say what the main ingredient is. I think everybody who's successful in this business has one common ingredient--the talent God gave us. The rest depends upon how it's used. Q: What do you look for, musically, in new songs for concerts and recordings? 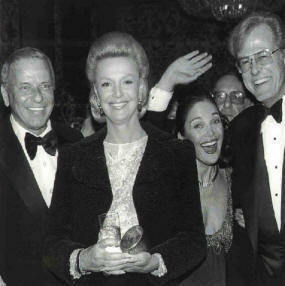 SINATRA: I'm looking for the same elements I've sought throughout my career: a melody that sings, flows smoothly, allows me to become totally involved and gives me room for my own phrasing and timing; strong, poetic lyrics that are solidly related to the music and tell a good story; fresh, imaginative arrangements that provide a glow to the words and music. In short, I look for outstanding musicianship, taste, dedication and professionalism. Q: You've been critical of the press. Yet, if you were a reporter and were given an assignment to do a story on Frank Sinatra, how would you handle it? SINATRA: It's no secret I've been critical of the press, and I feel justified. I have great respect for responsible, professional journalists who are objective, unbiased and report the truth. On the other hand, there are reporters an editors who distort, exaggerate, misquote or color the news without bothering to check the facts. They're the ones who give journalism a bad name, and people who are in the public eye are often victims of unscrupulous headline-hunting reporters. Q: Do you think you would have had a more serene, happier life if you had not achieved all the fame and glory? Was it worth all the problems and the pressures? SINATRA: More serene, perhaps, but certainly not happier. We all have problems and pressures, regardless of the kind of life we lead, in show business or any other field. Has it been worth it all? Sure it has, because I love what I'm doing and I'm one of the happiest people I know. Q: Who, in your opinion, are the best, most promising songwriters in the business today? SINATRA: There are several contemporary composers whose talent I regard highly and they'll get even better as they progress. I've been using, with much personal satisfaction and fine audience reaction, some of the best material of songwriters such as George Harrison, Jim Webb, David Gates, Carol Conners, Carol Bayer Sager, John Denver and Alan and Marilyn Bergman. Q: You once said that if reincarnation were possible you'd like to return as opera singer Luciano Pavarotti. My question is, Do you prefer classical and operatic music for your own enjoyment? SINATRA: I like all music--opera, symphony, pop, show tunes, etc--and I'm comfortable with most of today's music, except the acid rock. I do, however, admire the technique and clarity of opera performers. Q: What was the most memorable moment in your life? SINATRA: There have been several, among them, the two times that I became a grandfather, first of Angela Jennifer Lambert, then of her sister, Amanda Catherine Lambert. They gave me bigger thrills than any standing ovation. Q: Would you rather sing in nightclubs or in concerts? SINATRA: At heart, I guess I'm a saloon singer because there's a greater intimacy between performer and audience in a nightclub. Then again, I love the excitement of appearing before a big concert audience. Let's just say that the place isn't important, as long as everybody has a good time. Q: Which do you like best, singing or acting? SINATRA: I started out as a singer and I'll end up as a singer. The acting was in between. I prefer not to classify or pigeonhole my craft because there's a lot of acting in my singing and my singing has helped my acting. Q: Did you have any training in singing or acting prior to your first professional experience as an entertainer? SINATRA: The only background I had in singing was with the glee club at Demerest High in Hoboken, NJ. I had no training in either singing or acting and I learned everything from experience. I performed at parties, social clubs, the corner candy store--any place people would listen to me. SINATRA: I've sung and recorded so many wonderful songs over the years that it would be impossible to name one in particular as my favorite. They've all been special for me for one reason or another. Q: Will you go on performing for the rest of your life? SINATRA: You'd better believe it!